The Chyangra Goat is a well-known breed of mountain goats found in the high altitudes of the Himalayan region, and produces the world’s most expensive and finest quality of luxurious cashmere wool. Though also used for meat, they are more famous for the development of the world-famous Pashmina wool industry in Nepal and India. 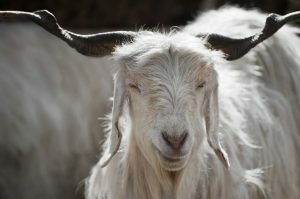 The Chyangra goat developed in the Himalayan mountain ranges of India, Nepal, and parts of Pakistan and China at an altitude of 9000 feet and above. The Chyangra goats are valued since thousands of years for their extremely fine quality wool, and had been popular among the royalties and other elite classes. 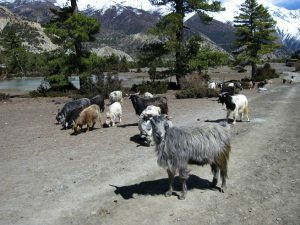 Though the exact date is not known, the scriptures, the Nepalese breeders, and the local people, including the wool traders say that, references to the Chyangra breed has been made even in the Indian epic ‘Mahabharata’, where the kings and the emperors would use a fine variety of wool derived from a breed of wooly goats from the Himalayan regions, which is the Chyangra. 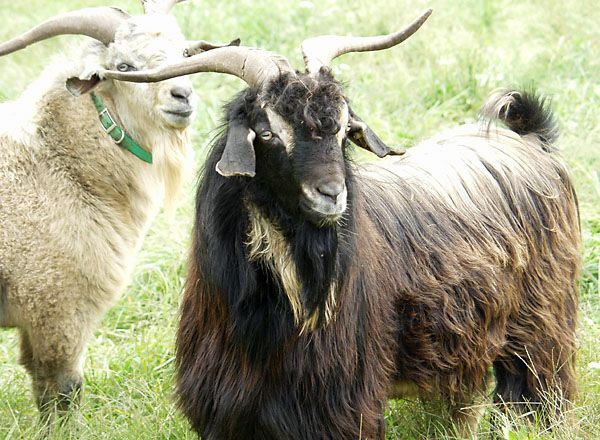 Though these goats are cultivated for their high quality Pashmina wool, they are all sought for their meat. The goats are often sacrificed in the most popular religious festival of Nepal called ‘Dashain’. 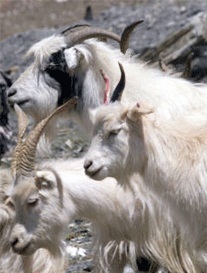 The pashmina wool is actually a natural adaptation of the Chyangra goat. The wool protects the animal from the extreme weather conditions around the Himalayas. The property of the pashmina is such that, it can retain ample heat to protect the animal from the fierce biting cold and the severe blitz of the high mountains, all the year round. Extracted from the inner coats of the Chyangra goat, discarding the relatively coarse and thick outer coat, the ‘Pashmina’ wool is the world’s softest, weightless, exotically delicate, and finest natural insulating fiber. Thus, only the inner layer fibers with a thickness of below 16.5 microns are typically used as the Pashmina. The downy fur around the chest and the neck areas produces the finest quality of wool. The fine quality of this cashmere wool is found from goats living in high altitudes, starting from 3000 meters in the Himalayas, but higher the better. This exotic and gossamer property of the Pashmina wool has popularized it around the globe as the ‘Diamond Fiber’. Each Chyangra goat produces only 100 grams or less of usable wool. The Chyangra Goat gets its name from its habitat in the Trans Himalayan region referred to as the ‘Chyangra’. It takes the wool of three Chyangra goats to make one pure pashmina scarf.